Every household needs a flashlight and a reliable one for that matter. 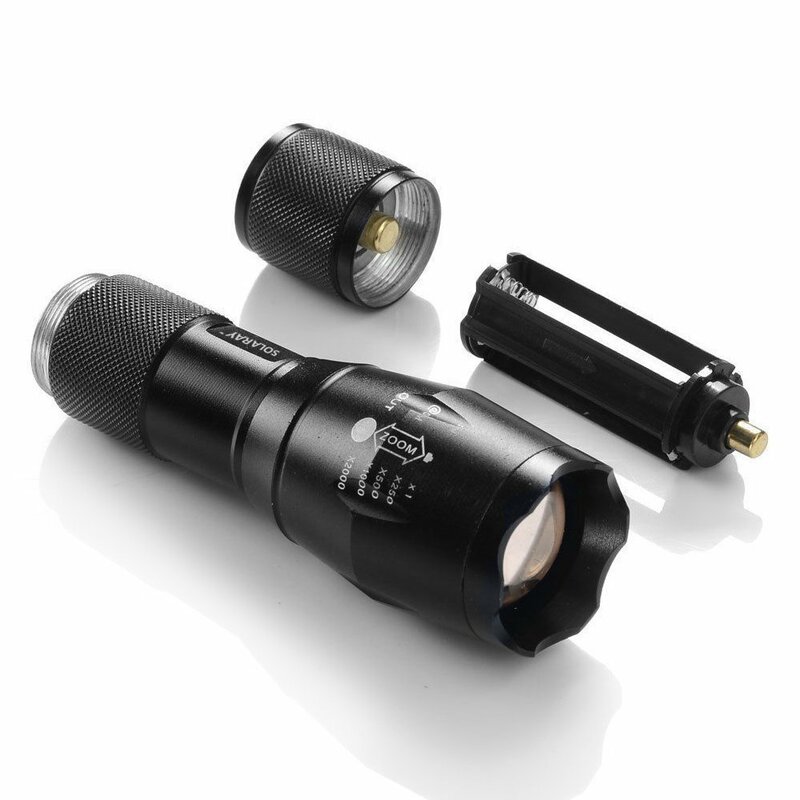 Whether you are a flashlight junkie or searching for one to use during emergencies, power outage, night walks or camping a flashlight should have the capacity to provide excellent illumination for a long time without the need to change batteries. Solaray Pro ZX-1 Professional Flashlight does all this and goes on to achieve even more with its adjustable focus zoom lenses, five light modes and max twelve hundred lumens. It’s no wonder that the solaray pro is one of the brightest tactical LED flashlight. This chip is capable of producing up to twelve hundred lumens; this is more than enough to light up a whole room or provide quality visibility in total darkness to objects as far as one hundred and fifty yards. When this brightness is combined with the zoom capability, you can focus the beam on an object that is even eight hundred meters away. The XML T6 chip used is also durable, so you don’t have to worry about having to replace it every single day. The solaray pro ZX-1 professional flashlight has its outer reinforced body made of aircraft grade aluminum to ensure durability even in the most extreme conditions such as pressure and corrosion. The lens is also high quality so you can rest assured that it will not be cracking from a mere slip off. It’s important to note that the aluminum used is lighter than most metals while still strong, so you will not be feeling like you carrying along a stone in your pocket. It also features a hardened anodized finish for electrical insulation and corrosion protection. The internal driver electronics offers you the ability to switch between five different modes on the click of a button. From small beam to mid-range beam to high beam, bright tactical beam to SOS beam. With this ability to change between all five modes you have the stronger hand in case of an emergency and you need to switch quickly. With the 3000 mAh rechargeable battery you will safely use any of these modes without fear of running out of juice. The Solaray Pro ZX-1 Professional Flashlight isn’t just another flashlight for general illumination. The bezel is designing for striking in case you need to use it in the line of self-defense. The tactical mode is so bright that it instantly stuns anyone who is unfortunate enough to be in its direct eye line sight, this comes in handy when repelling any attackers. With its long-lasting battery, it can also be used as an alternative source of light during prolonged electricity blackouts or during camping. The flashlight also can be utilized for security patrol by the police as it quickly harnesses on to the weapon belt through the attached belt clip. Forgot to completely recharge the lithium battery? Well, no need to worry as the solaray pro ZX-1 professional flashlight comes with a two-way power supply, you can pick either the rechargeable battery or you can switch to the three units of AAA alkaline battery, this ensures you don’t end up in darkness when you most need your flashlight. The rechargeable battery has protected circuit board to curb the risk of short-circuiting. Q: Do I need to recharge every night? A: No, the Li-on battery has a 3000 capacity which is more than enough for a while. Q: Is this flashlight bulky? A: No, its body is made using lightweight aviation aluminum that is strong but light. Q: Can I take out into the rain? A: Yes, it is waterproof and corrosion proof. While there are many tactical flashlights out there, few come any closer to the ZX. With its long-lasting battery and multiple modes, it not only counts as a source of light but also as a defense weapon so you can be sure no one is likely to sneak on you and get away with it. With the aluminum body, it can be used in any line of work without sustaining any significant damages. So, go ahead and upgrade to one of these powerful devices and enjoy taking it around and you can be sure there will not be any regrets.